Debra Racheter is the owner and founder of Crest Ridge Saddlery of Lowry City Missouri. Since 1998, Debra has been professionally fitting horses which led to designing and manufacturing saddles. Crest Ridge Saddlery is a family-owned and operated business run by Debra and her daughter Sarah . Debra’s impetus in founding Crest Ridge Saddlery was her 17 years as a trail guide at the horseman’s resort she built and operated in North Central Arkansas. She saw firsthand the problems caused by ill-fitting saddles and the difficulties her customers had in finding quality saddles the fit both horse and rider. 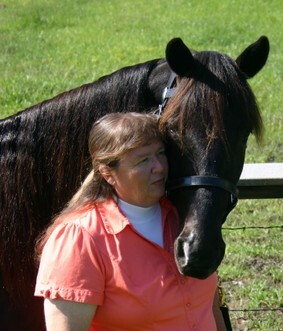 Her experiences led her to become a master saddle fitter, specializing in gaited horses and mules. That led her to building saddles, with an emphasis on gaited horses and mules. She has been a presenter at numerous Equine trade shows, including Equine Affaire, Horse World Expo, Midwest Horse Fair and the Minnesota Horse Expo. Debra has also appeared on RFD-TV's "All Around Performance Horse" where she gave a demonstration on saddle fitting. This is our promise to you as a customer. We strive to make every saddle a perfect fit. No two gaited horses, stock horses or mules are exactly alike. What is most important in fitting one is the bar angle, width, length, clearance, and the amount of rocker in the tree. The first question is which of our trees will fit your horse the closest. We have a regular tree for light boned horses and a wide tree for the bigger framed animals and even an extra wide that is required in some cases. Then we can do a lot with different types of pads and slight rigging changes to make each one fit perfectly. If you request us to send you one of our saddles we guarantee that each will not only fit, but fit well. Within seven days we will help you properly fit your horse if you are having trouble. We realize there are some circumstances that require longer than seven days. All we ask is that you call us or send us an email to request an extension within the original seven day period. When you receive your saddle I ask you to send me photos from the front, side and rear of the horse as found on our "Checking Saddle Fit” page. If you think there is a problem with the fitting please call us. If we cannot obtain an acceptable fit working together, then please call, request an RMA number, and simply send it back clean and free of horse hair. No other questions will be asked. There are no gimmicks. You decide if the saddle fits satisfactorily. We truly want this to be the best fitting saddle that you will ever have to buy for your horse. Below I have outlined our company's policies. The links under Info above will take you to our Guarantee, Warranty and Returns pages. Most of our saddles and much of our tack are custom made with orders forwarded to our Amish craftsman within a business day of your order. You will be given an estimate of the time to produce, inspect and ship your order when it is placed. 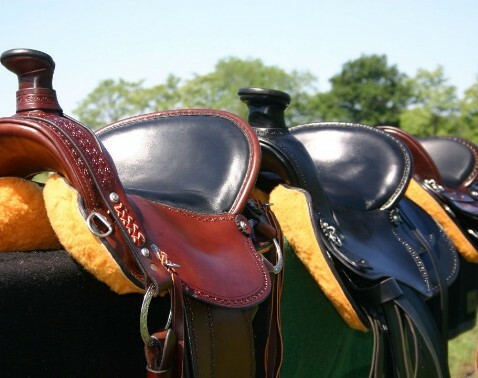 The time required to produce a saddle varies depending on how many saddles are already on order and the time to required to obtain any special materials, if any, your order may require. Our goal is to deliver your custom built saddle within eight weeks, and sooner if we can do so without compromising on quality. We ship via UPS Ground Service. Expedited shipping and shipping outside the continental U.S. are available upon request, but additional charges will apply. We ship credit card orders to verified ("confirmed") addresses only to when an order is paid for with a credit card. This protects us all against credit card fraud. Package tracking numbers are available upon request. Delivery timing is dependent upon UPS. Normally, UPS delivers saddles shipped within the continental U.S. within twelve days of shipping and often much quicker than that. Shipping delays may occur due to seasonal shipping delays. The shipping price quoted will not include any import duty, clearance costs, retail taxes or the like that may apply to your particular country. Unfortunately the import laws and requirements vary considerably in different countries. Accordingly you are responsible for these additional charges should they apply. If we are charged for your duties, clearance costs or taxes on the goods, we will debit the cost from your credit card. Please check with your local import broker or customs office prior to ordering. If the package is seized by Customs for any reason whatsoever and we do not receive the package back, we will not issue a refund. A valid credit card number is all we require to start work on your saddle. No saddle will leave our premises without being paid in full, there are no exceptions. The sport of trail riding a horse is done with some inherent risks. Due to the nature of the type of products we sell, Crest Ridge Saddlery will not be held responsible for the use or misuse of our products. Upon receipt of the item it is your responsibility to thoroughly inspect each item for safety and soundness before use.